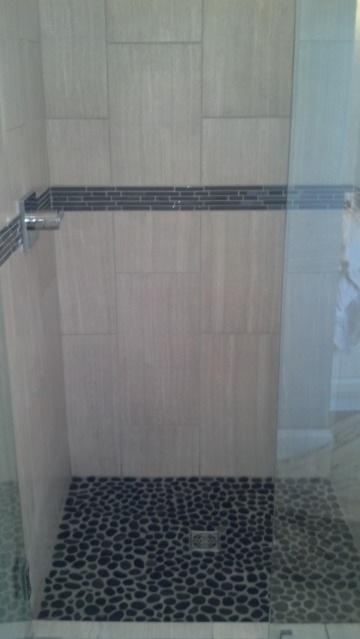 Custom designed and built shower with lineal drian and teak bench. 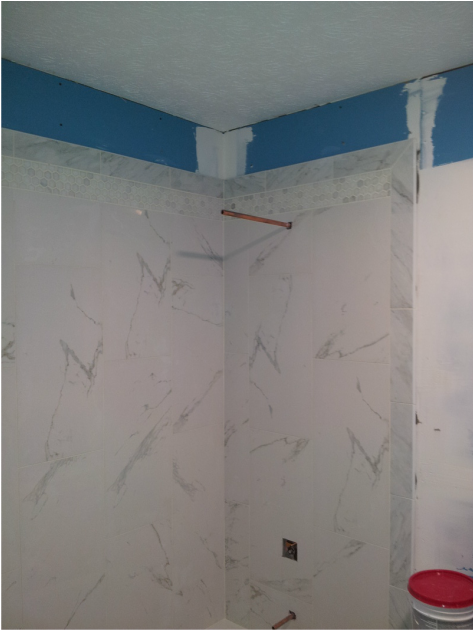 Pencil edge and custom made bullnose trim the shower and accent. 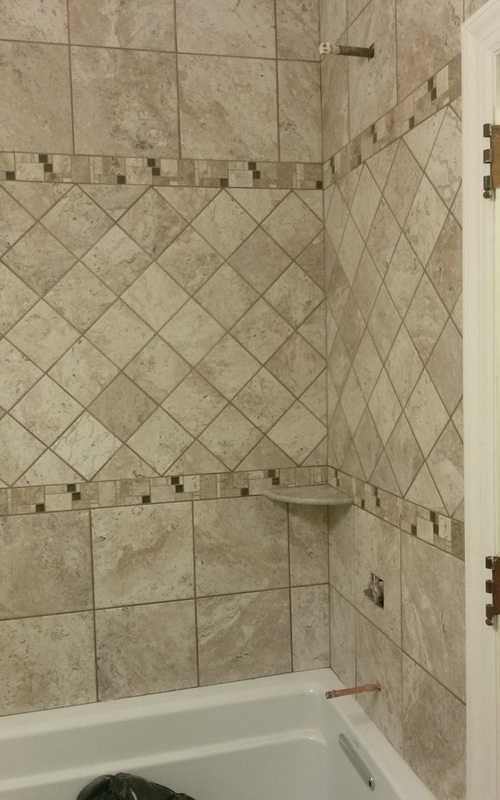 Installed with 1/16" grout joint, grouted with fusion pro. 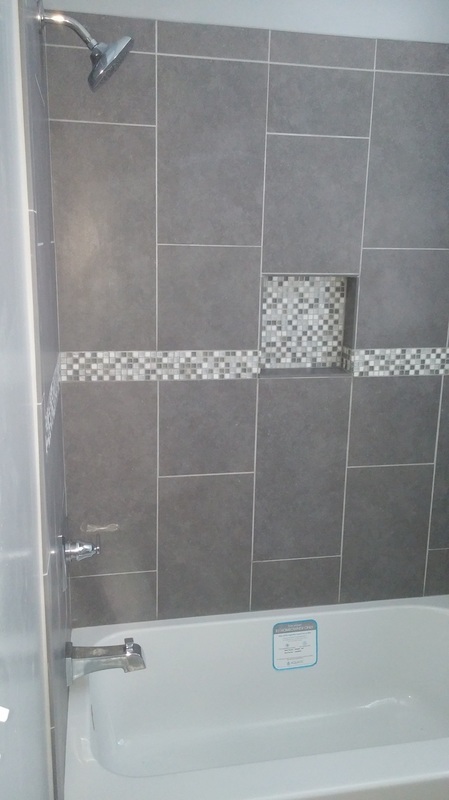 After proper waterproofing is complete, layout is the next step that needs to be planed out to complete a successful shower install. 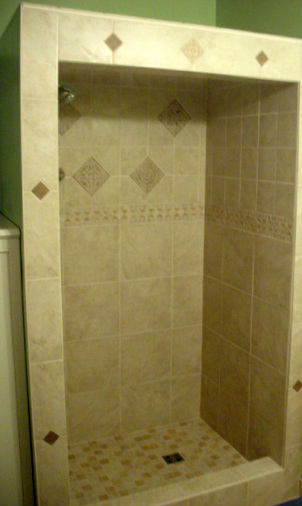 This niche was laid out to be surrounded by full tile and centered inside the shower as well as the drain and valve. The mural and accent border were placed in the most visually appealing spot. 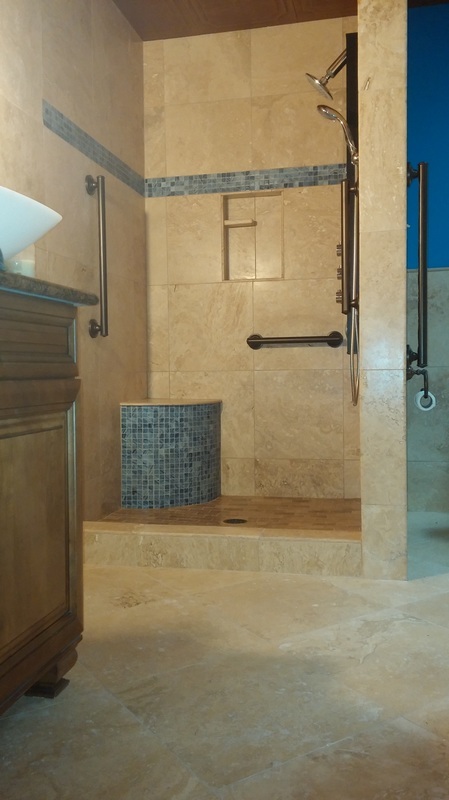 This shower has a oiled bronze circle drain to match the valve and shower head. 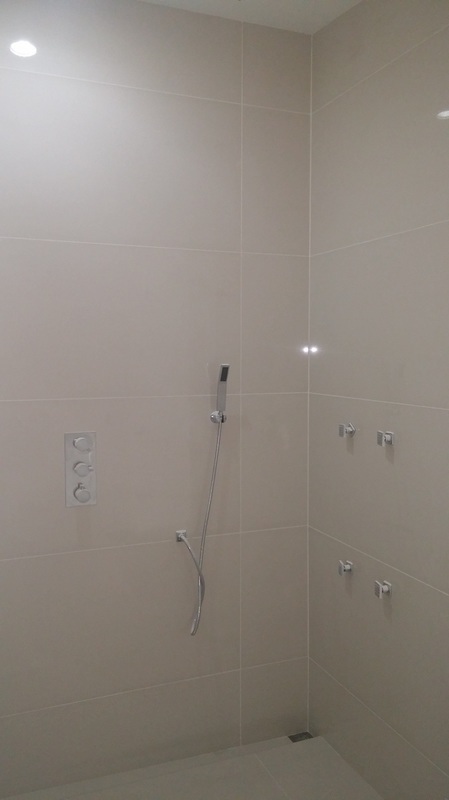 This steam shower was prepared with vaporproof membrane on cementboard. 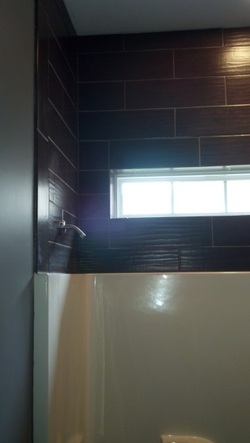 Walls where prepared perfectly plum to accept 12x20 tile with 1/16" grout joint and double accent strip. 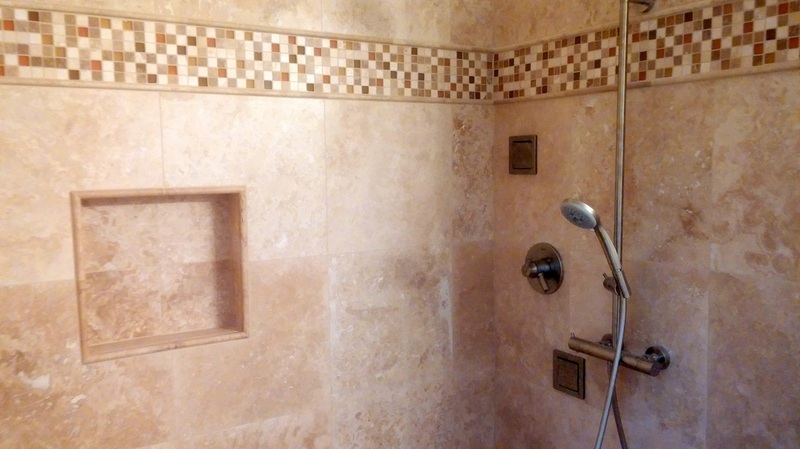 The niche in this shower is surrounded by full tile and the stone accent. Matching radius cuts of marble where made for soap. bench was frammed to be pitched 1/4" per ft and waterproof with surface applied liquid. This shower has a bench seat with multipal body sprayers. A wall was constructed to enclose the bench and to allow for a single 28" glass door. 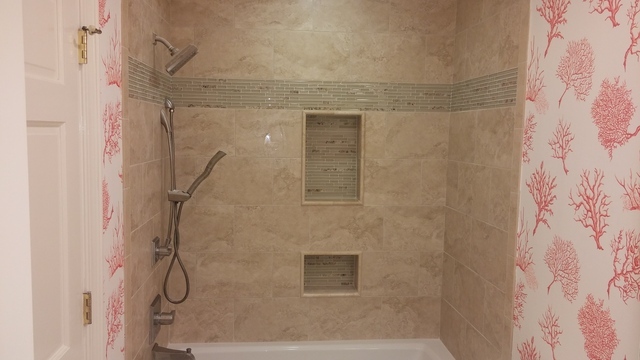 This showers design was built around the large shelf. 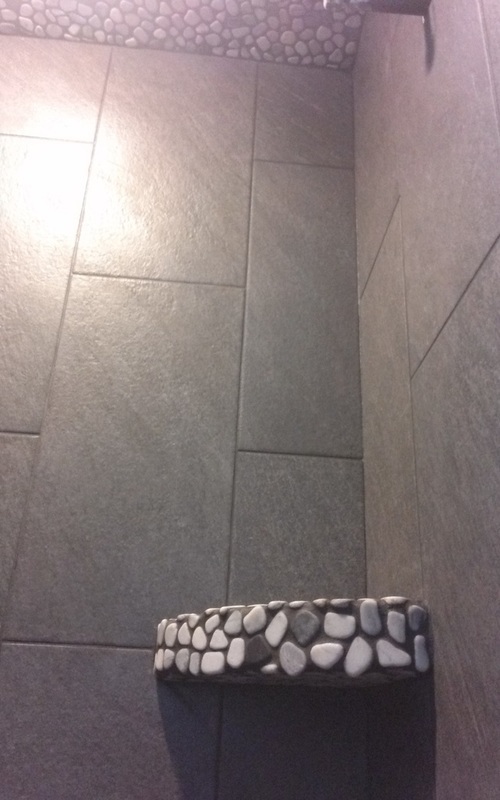 The natural stone accent strip runs inside the shelf. A piece of marble was polished on site to make a divider and a soap dish. This shelf was designed before construction began to allow for frame work to be perfectly constructed to allow for full tile around shelf. 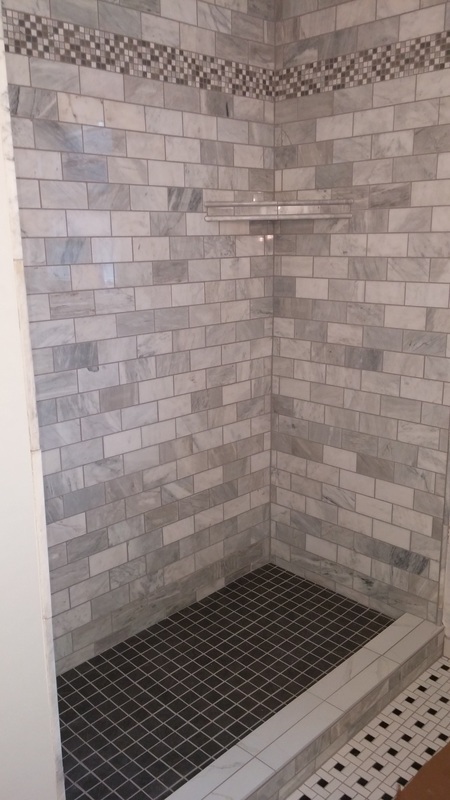 These well made 13x13" tile are spaced 1/16" and grouted with fusion pro. 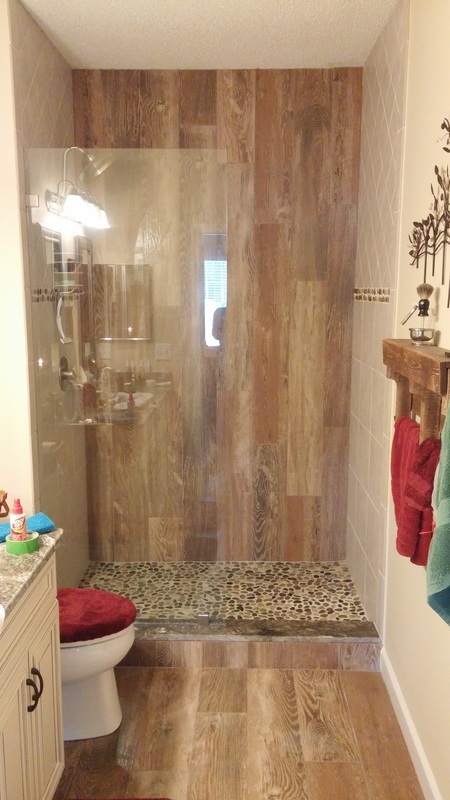 This walk-in shower is big enough to not need an expensive glass door to contain water. 3x3 floor tile all custom cut to allow for full tile at perimeter. 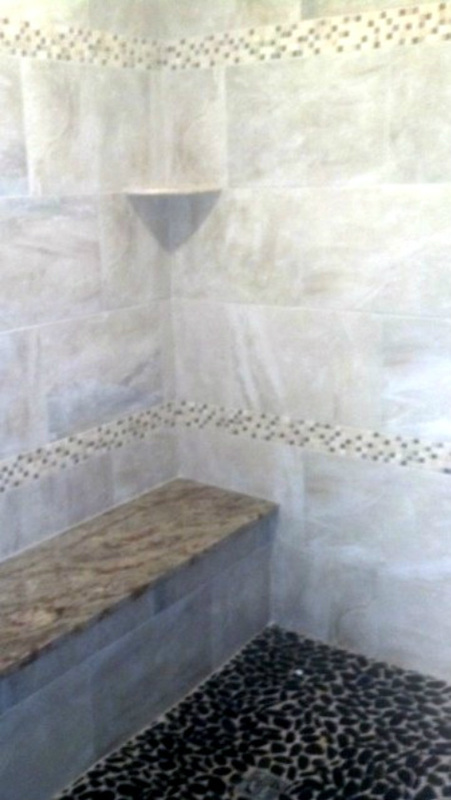 16" radius bench is the perfect size bench that maximizes space inside shower. 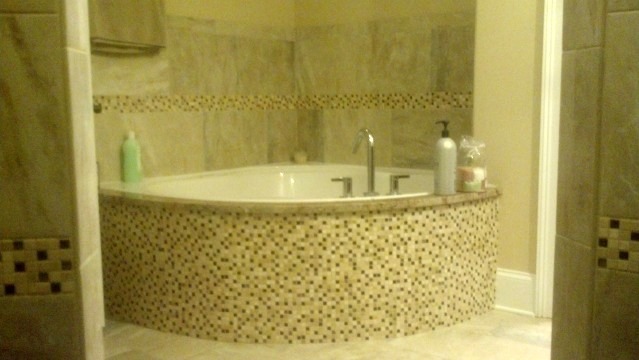 A Dolphin mosaic is featured in this 4x4 tumbled stone tub surround. Using natural stone does have its advantages. 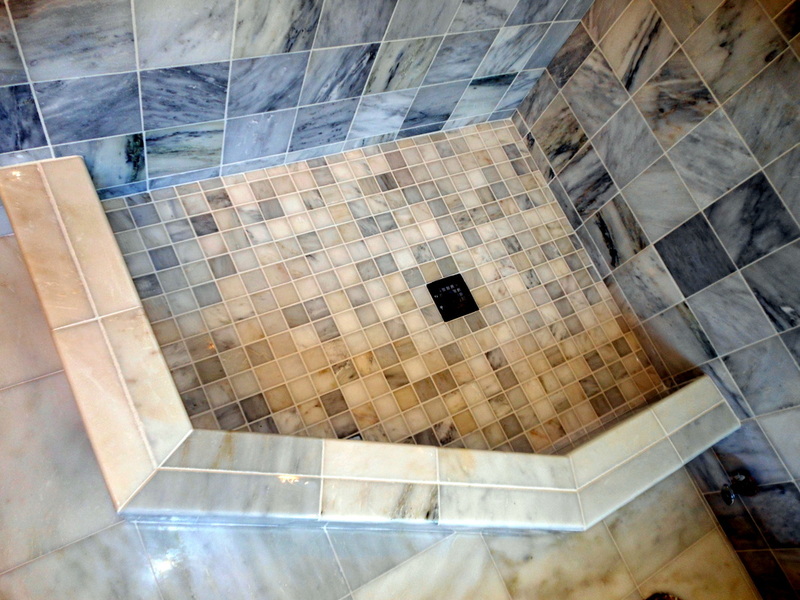 In this shower there are many edges and corners that were constructed by bull-nosing, shaping the edge of the tile, so that it meets the adjoining tile in a more sleek manner. 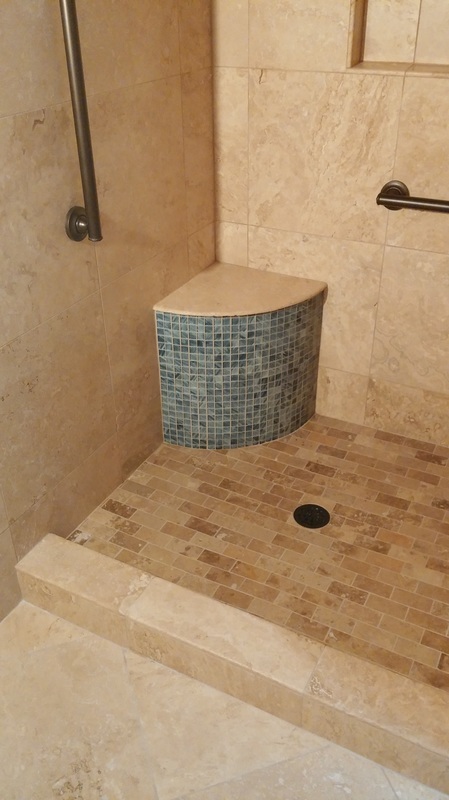 Because the edges can be shaped, these 18" pieces of travertine where ripped down to 9" squares and then sanded on the edges and used above the marble listello. 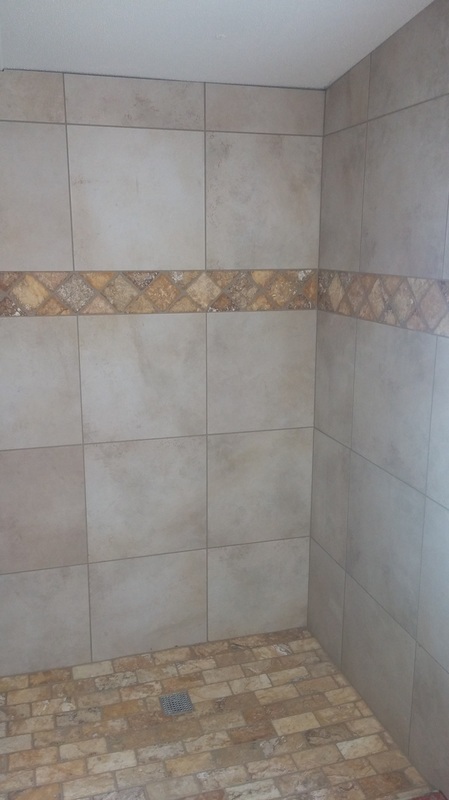 With most ceramic tiles it is important to hide the cut edge of the tile in the corner because after it is cut it looks nothing like the factory edge of the tile. Bull-nosing ceramic is typically not visually appealing as the color of the tile is only on the surface. However some manufactures do make accompanying bull-nose to there field tiles but typically only in 3x12" pieces. So natural stone can give many more possibilities when bull-nosing is needed. 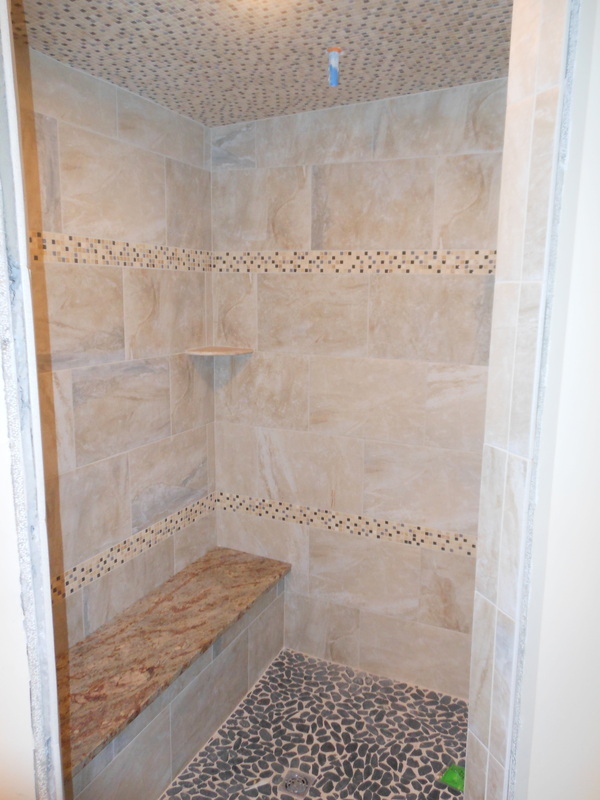 This shower was constructed with hardibacker cement board with kerdi waterproof membrane. 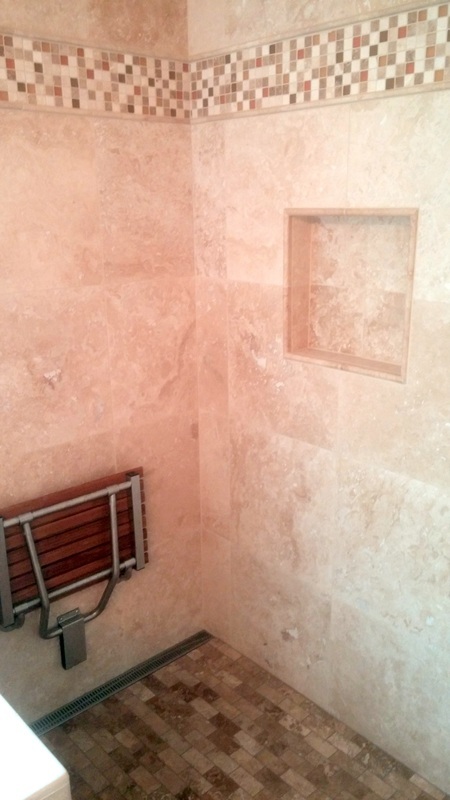 Since travertine is porous, waterproofing the walls prevents any chance of moisture transfer. 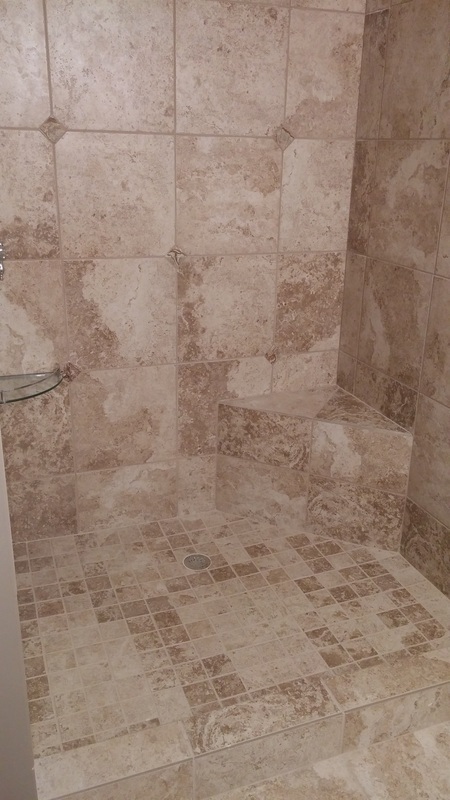 The travertine was sealed two times both before and after grouting to protect the stone and to enhance the coloring of the travertine. 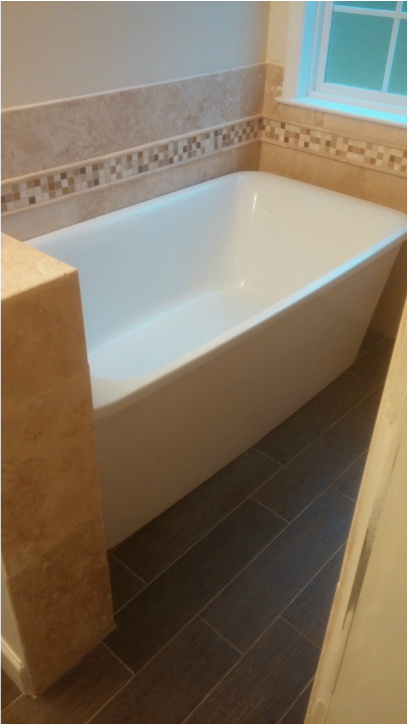 Tub surround with travertine soap dish. 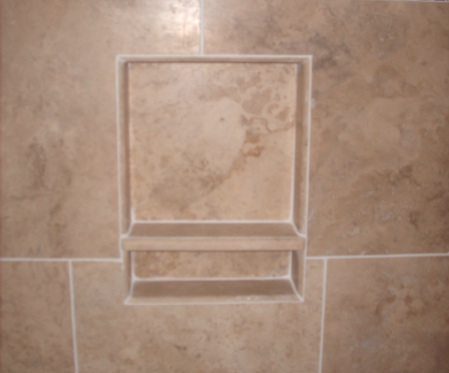 8x10 wall tile with a travertine pencil border on top. 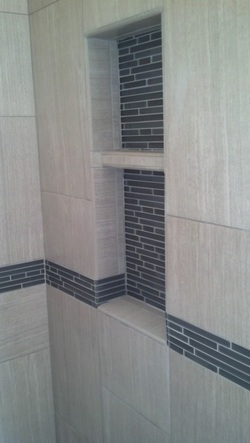 Matching corner shelves where installed amd 1/8" grout joint was filled with urethane grout. Shower Nitches can be constructed in a varity of ways. Waterproofing and properly sloping the shelves is the most important step. Adding a dividing shelf is a great way to make the most out of your niche. 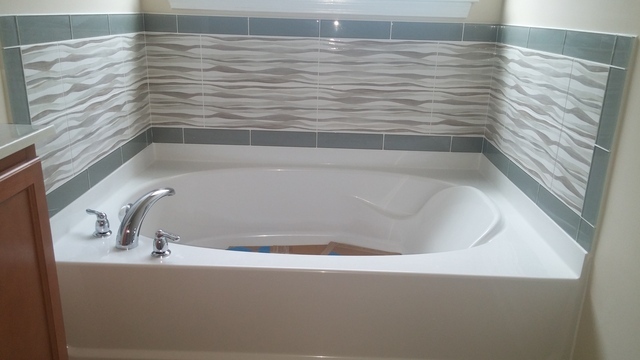 Tub surround with lineal mosaic as accent. 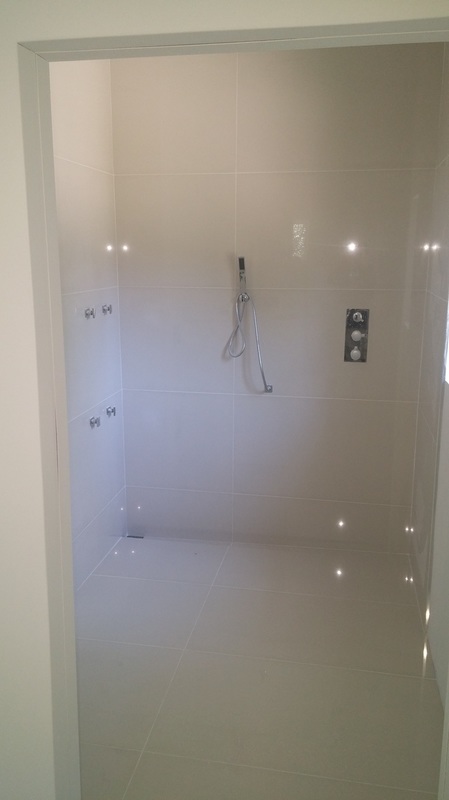 This all white shower will last a lifetime and be easy to clean with fusion pro grout. 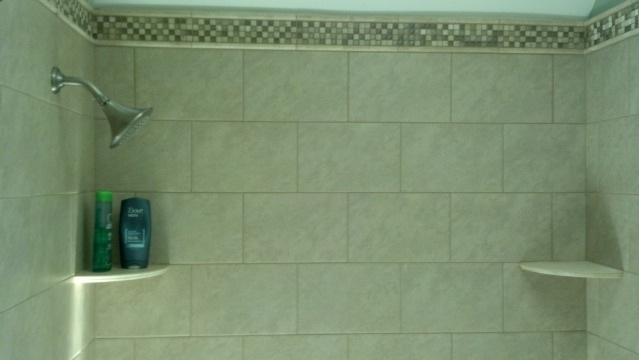 Time was well spent correcting plumb and flatness in walls to make a smooth wall with unforgiving 6x6 tile. 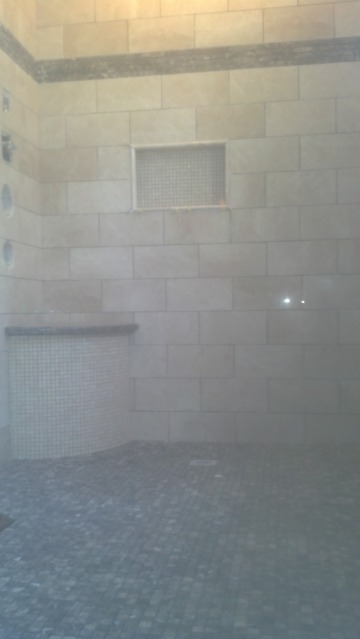 This shower was designed around the travertine medallion centered in the 5' wall. 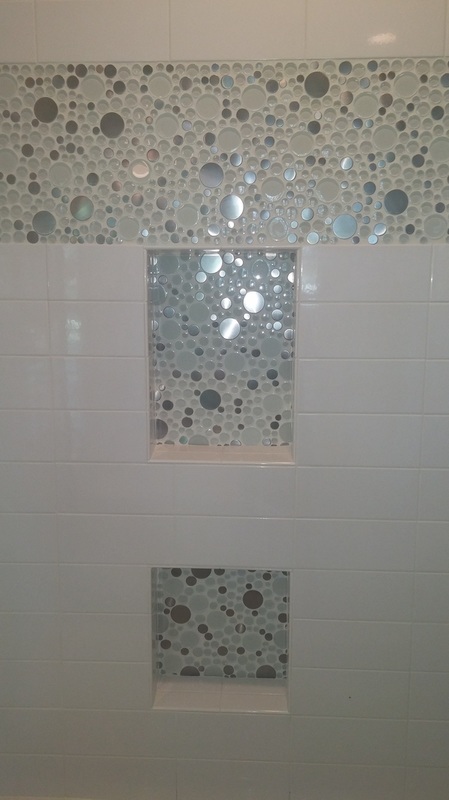 Dots where placed in every intersecting tile and a border tile was custom cut bellow the bullnose. 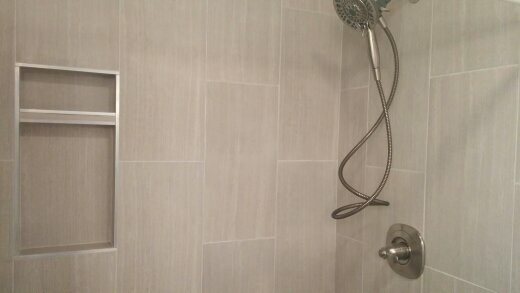 There was not an uncut piece of tile in this shower. Showers constructed using the mud pan method require sloping a thick bed of mud to the drain hole, installing a rubber liner and then installing another layer of mud before finally installing tile. This can be a multiple day process since you need to wait until the mud cures before moving to the next step. The drain associated with this type of pan construction is called a weep hole drain which "weeps" away water that makes its way under the 2nd layer of mud to the rubber liner. If the rubber liner has a leak or the first mud bed was not properly sloped, it will lead to failure. As an alternative to constructing a time consuming mud shower pan, kerdi shower kits provide you with a presloped pan that can be cut to size. The pan is then covered with a waterproof fleece membrane that is overlapped on the sides and corners and is directly tiled over. A proprietary drain system is installed which eliminates the need for a weep hole drain since the pan is waterproofed directly bellow the mortar. The kerdi method cuts down on installation time and is as durable as a properly installed mud bed. This shower pan has a square brushed nickle drain that was installed on a 45. 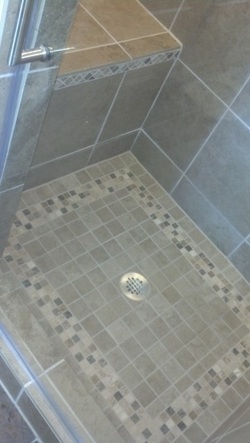 Epoxy grout was used to provide a trouble free shower. 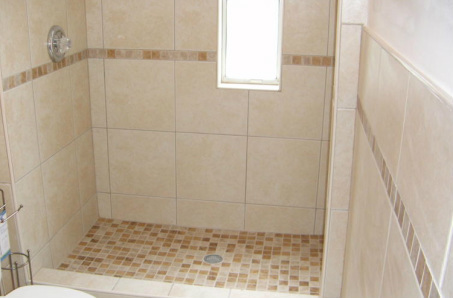 Constructing a tile shower in a small bathroom is the best way to make the most out of your space. 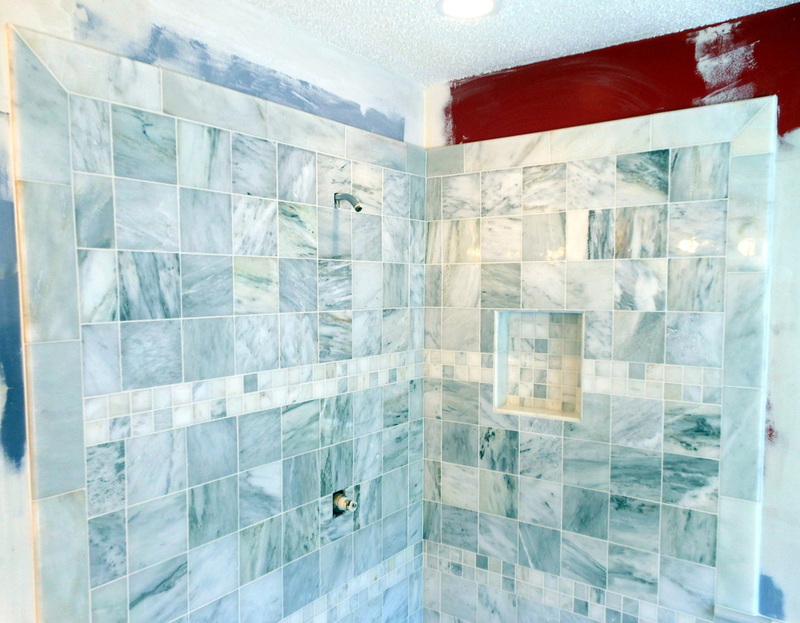 With the addition of this glass/stone mosaic mix around the tub and on top of the cultured marble shower this master bath went from basic to beautiful for very little money. 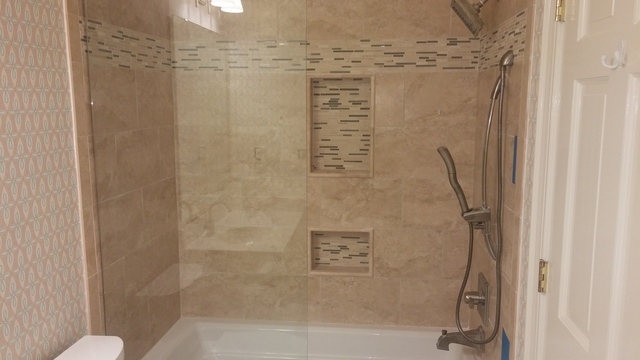 Glass was bullnosed and polished on the outside corners to match the bullnosed tile. 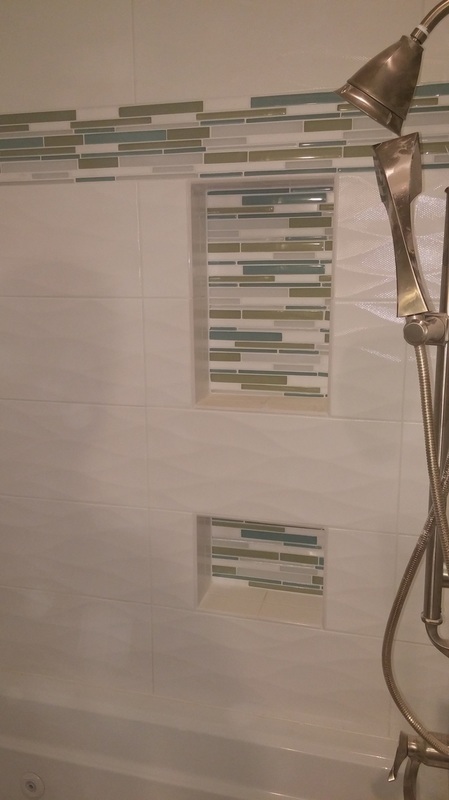 12x24 tile was used in this kerdi shower with a lineal glass accent centered at valve and running through bottom of 2 tier shelf. 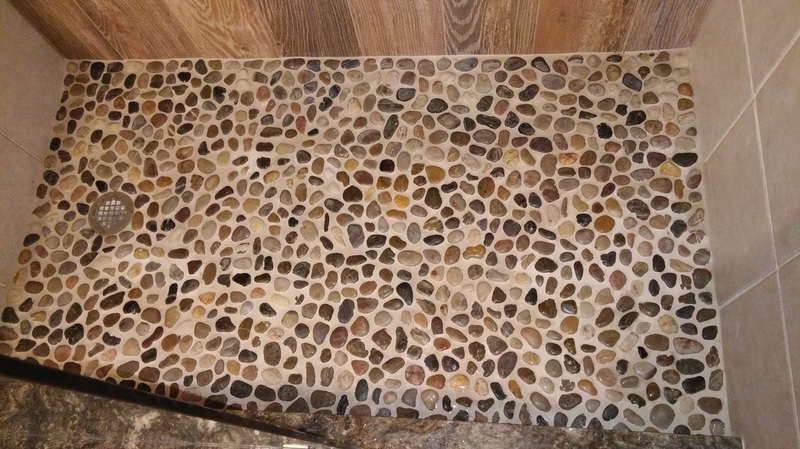 RIver rock pebbles where installed on shower floor. 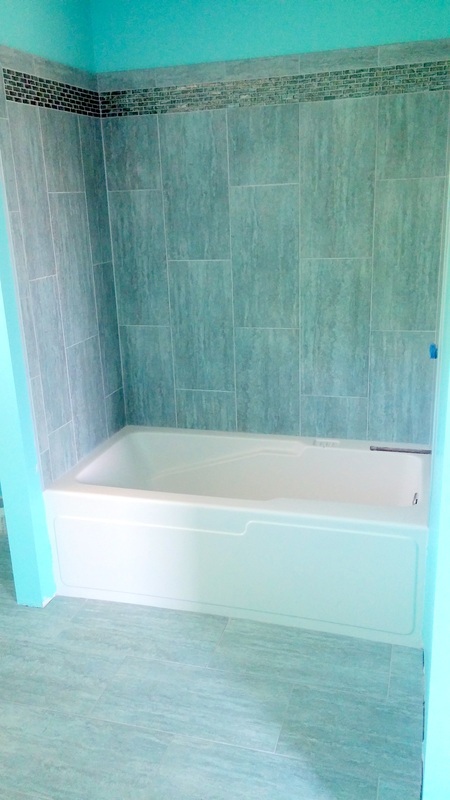 16" ceramic tile with schluter beige rondec profile at all edges and changes of plain. 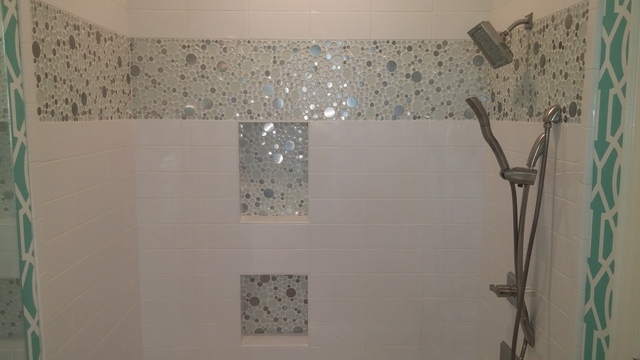 2x2 shower pan tile was used as an accent strip. 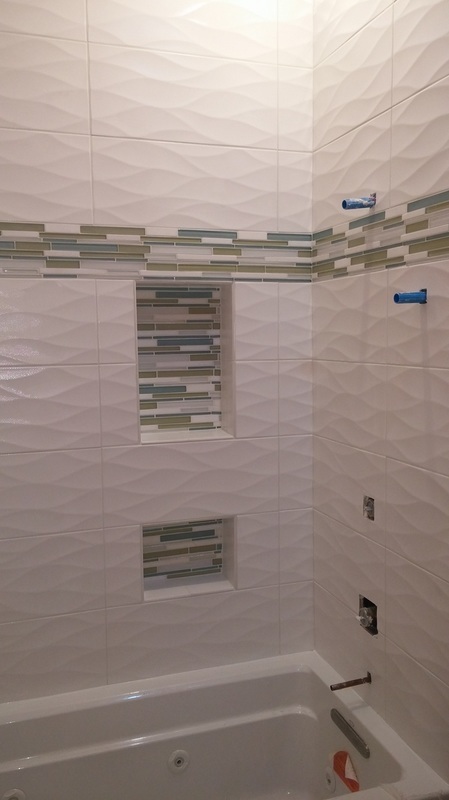 Although this 3d shower design was slightly changed due to tile sizing and ceiling height, It provided the customer with a visualization of the final product and helped aid in choosing a tile color and size.